Eddie Dawson: husband, beloved father, grandfather, uncle, and friend to so many. Eddie was born on July 24, 1926 and left this life to be with his heavenly father on March 27, 2019. Eddie was the only son of Ennis E. Dawson and Irma L. Aycock and joined four sisters, Alene, Helen, Geneva and Bonnie. The family moved to Stephenville where Eddie worked on a farm baling hay, and a local nursery planting trees. Eddie was drafted into the US Army in November of 1944 in Fort Worth Texas, where he trained with his company. Eddie was sent overseas and sailed to La Harve, France and was stationed in Austria after the war as part of the Occupation forces responsible for prisoners of war. He was a sergeant in charge of the motor pool. His company returned home on the Queen Mary to New York, and he was honorably discharged on August 10, 1946. 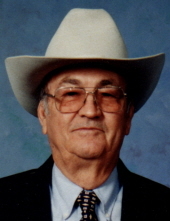 Eddie began work for Continental Oil Company in Stephenville, Texas in October of 1947 on a roustabout crew. He later joined a crew in Shattuck, Oklahoma as a driller. There he met Jonet Smith and they were married December 23, 1949 and so their journey began. Eddie and Jonet moved many times, living in the Rockies from Montana to New Mexico. They lived on three coasts including California, the Gulf and Canada. In August 1965 the family moved to Ponca City, Oklahoma where Eddie took a job in the Geophysics Lab. He traveled from Alaska to California and Louisiana working with crews on equipment in the fields. He was one of several men to help Mertz get their start after they secured their lease. The first of the Mertz vibrators that he helped with went to Hudson Bay. Eddie retired from Conoco oil in 1985. Eddie and Jonet were long time members of First Baptist Church where they were active in teaching Sunday school in the children’s and preschool areas. Eddie went on Mission trips to Alaska, Arizona and closer to home, Kaw City, to help add to their buildings. He made many trips to Falls Creek to help repair or refurbish the cabin and take students for the week stay. Eddie was always masterful at working with his hands. Many days you could find him in his workshop creating beautiful wooden pieces for others, or for arts and craft shows. He always had a bountiful garden and enjoyed sharing it with family and friends. He grew a variety of things: okra, black eyed peas, tomatoes, peppers, squash and zucchini to name a few, and a large plot of asparagus. One year friends came to the rescue and tended to his garden, watered and kept the yard up, when he was visiting his son and daughter in law and he had to have an emergency appendectomy, and was out for a month. He loved to make candy around Christmas and was known far and wide for his peanut brittle, a family recipe from Jonet’s aunt, and it was delicious. Everyone who tasted it loved it, just ask Les Gilliam! He volunteered at the Opportunity Center and the Caboose Thrift Store. Eddie is preceded in death by his parents, four sisters; 2 infant sons, Michael in 1951 and Roger in 1963; brother in law Warren Smith and wife Peggy Smith, and sister in law Nancy Smith. He is survived by his wife of 69 years, Jonet Dawson of the home; son Grant Dawson of Ponca City, and son Lindsey and wife Annette Dawson of Keller, Texas; grandsons, Joshua Dawson of Fort Worth, Hunter Dawson and girlfriend Courtney Haymore of Irving, and Trevor and Brittany Dawson of San Antonio, Texas, along with many nieces and nephews. A funeral will be held at the First Baptist Church on Saturday March 30, 2019 at 2 pm. Eddie will be laid to rest in Resthaven Memorial Park. A family visitation will be held at the funeral home on Friday, March 29, 2019 from 6-8pm. To send flowers or a remembrance gift to the family of Eddie Dawson, please visit our Tribute Store. "Email Address" would like to share the life celebration of Eddie Dawson. Click on the "link" to go to share a favorite memory or leave a condolence message for the family.